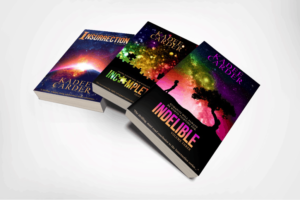 FEATURED GUEST: Author Kadee Carder and Her New Release!!! Many sunsets ago, while Texas trees blossomed in the crisp spring air, my dad stood in our garage, drilling a hole through a softball. He threaded a yellow cord through the hole and tied it in a firm knot, then strung it up on a wide, horizontal branch from a big shade tree in our grassy back yard. “This will help you fix your aim,” he’d said. “Grip the bat, line up your knuckles, and swing away.” I spent hours in the sunshine and wind, smacking my Louisville slugger against that softball, as the ball flung itself up and around the branch. The harder I hit, the faster that ball flew. See, I’m left handed. And while I adored the sport of softball, which I’d played since first or second grade, as a young teen I still struggled to hit strongly and consistently. Throughout the hours, I tired of the line up, grip, wind up, swing, follow through, wait for iiiiiiit, unwrap, and begin again of the practice. So as my creative mind wandered, I thought, what if this thing were ON FIRE and it was about to KILL ME?! You’d want to smack that sucker right into infinity, yeah? Me too. And that’s one element of how I created the idea of the “oxinal,” the killer artificially intelligent sentinels in my Insurrection trilogy. My process of writing usually begins with a character, too. Often, that character has some element of myself that I like or dislike, and I make that bigger. What would I want to be? What do I not want to be? Let’s inflate that and go from there. 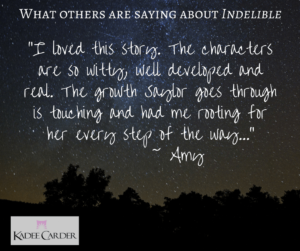 Characters drive stories, and I hope my readers fall in love with my characters and root for them as they deal with the consequences of their decisions. These characters must accomplish some important task, and I’ll put them through the wringer to get through it. Because…well, life’s like that. Can a hero be a hero if he never has to help anybody? Heroes get to rise above the ashes, and that’s the real adventure. Ever since, it’s been a similar process. I’ll give a scenario, he’ll come up with a way to improve the idea because he has been watching Star Trek and Star Wars and basically every other sci-fi or action movie since he was born, and then we shape it up to make the idea shiny and fresh and just plain awesome. I’d definitely want to use all of the tech and gadgetry in the Insurrection series and I think readers will too. Originally I had set the series in the 1980’s because the tech would have been mostly ahead of the times at that point, but as I tried to research I got absorbed in the era, found the tech wasn’t that outstanding within that setting, and then raised the stakes and switched gears to the future. Solar flares are an increasing risk that we deal with, and countries around the globe are currently creating emergency strategies in the event that a global disaster occurs where an electromagnetic flare wipes out our tech/electricity/power sources. Imagine what we’d do if all of our devices were suddenly useless? Imagine what we’d do if someone knew a huge flare was coming and stockpiled tech, data, and gold in a mountain? Who has the power (literally) in that brave new world? Ooh, aah! Raise the stakes! Once all of these elements get charted out on my whiteboard, I get lost in the thrilling world of these exciting characters and their struggles. This is what’s worked best for me and my four novels so far. And then as I write, if anything starts to feel strained or slow, here’s my last tip: When in doubt, blow something up. Since we get to create these experiences, let’s make them an adventure, and build heroes the readers admire. We humans have to be stronger than we ever imagine, love ourselves in the process, and dig in when the ground seems to sink. We not only relish adventures, we create them. That’s the basis of Saylor’s story in Kadee Carder’s young adult science fiction trilogy, Insurrection. 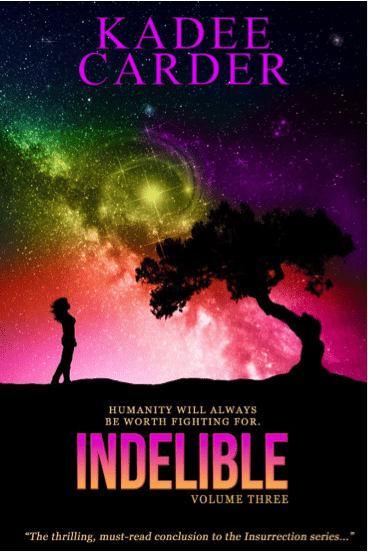 Volume One, Insurrection, and Volume Two, Incomplete, is now available on iTunes, Amazon Kindle, and Barnes & Noble Nook, and Volume Three, Indelible, will be available May 9th! Scintillating gadgetry, crackling romance, and endless riddles fill the pages of this trilogy, in a fresh adventure for the restless reader. Beneath the façade of covert laboratories and military exploits, Saylor’s story twists further in this thrilling final installment of the Insurrection trilogy. Concealed identities. Puzzling truths. Cryptic alliances. Amid hasty exits and curious arrivals, Saylor pursues the answers haunting her conscience. Dealing with the consequences of her decisions, will Saylor find herself invincible, or drawn even closer to Breame’s conniving promises? And with humanity’s existence at stake, will Saylor advance toward the brimming war, or succumb to the battle bubbling in her blood? Humanity will always be worth fighting for. “What are you saying, Mack?” Annoyed, Logan scuffed one boot in the dirt. “That’s not your call,” Logan argued. “And the glory,” Logan added. “But guys,” I tried to wave them off. “You have no argument.” Canaan radiated enthusiasm. “Yeah!” Other voices agreed, rallying. Eight faces shifted, eyes shining, reflecting those immense stories. 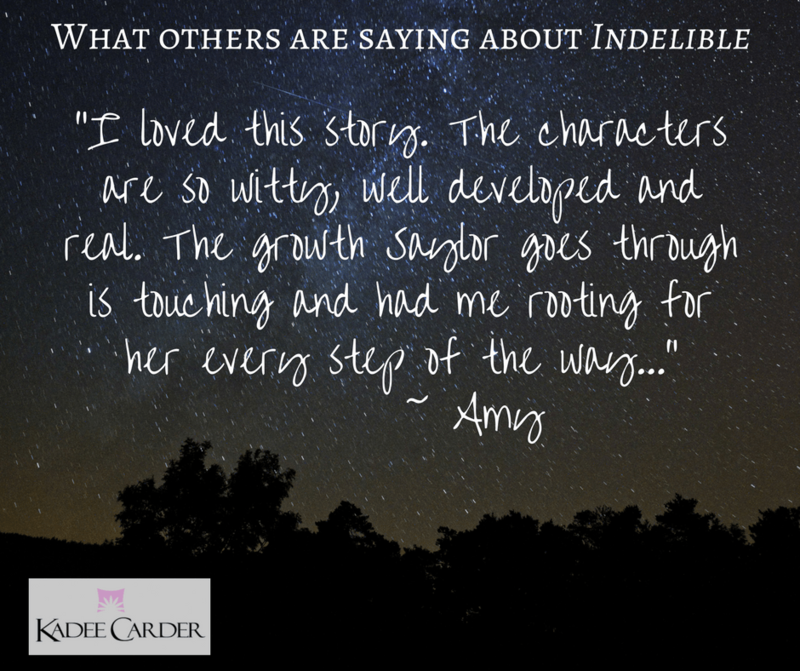 Deep in the heart of Texas, Kadee Carder resides with her husband and daughters. Carder earned a BA in Public Relations at Howard Payne University and an MFA in Creative Writing from National University. She teaches English courses on the university level and plans her schedule around coffee availability. 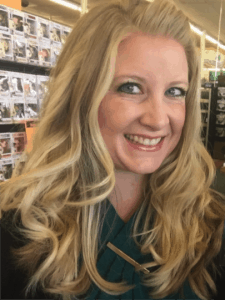 When she’s not dancing around the living room with her daughters, she helps at church activities, creates encouraging blogs, and orders pizza like a boss. FROM KADEE: I am giving away a free, empowering e-book to those who subscribe to my email list at kadeecarder.com. The book is called Ignite and offers a serving of inspiration, a dash of hope, and a cup of grace to help you get kickin’ on those challenging tasks you’ve got to do!